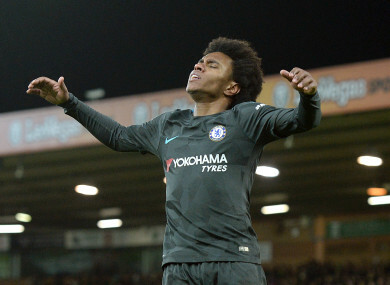 Willian shows his frustration after missing a chance. CHELSEA’S SECOND STRING flattered to deceive at Carrow Road as the 2017 FA Cup finalists were held to a 0-0 draw by Norwich City in the third round. Antonio Conte used Saturday’s clash as a chance to give some of his squad players more game time, but it backfired as they struggled to create openings and will need a replay if they are to progress. The likes of Kenedy, Michy Batshuayi and Willy Caballero were all given rare starts for the visitors, but they were easily marshalled by the Championship side. A disappointing first half failed to produce a single shot on target, and, although Chelsea improved slightly after the break thanks to Willian, finding a goal proved too much. It is a fourth unbeaten game in a row for Daniel Farke’s Canaries, who impressed at in defence but were shot shy in the final third, Caballero rarely tested despite a string of free-kicks in dangerous positions. So, the two sides will have to do it all again at Stamford Bridge later this month, an additional game that Conte could do without given Chelsea are still competing in three other competitions. Conte made nine changes from Chelsea’s 2-2 Premier League draw with Arsenal – including a first outing since November for David Luiz – and as a result it took the visitors time to find their rhythm. Norwich showed promising signs in the early exchanges without every worrying Caballero, only a misunderstanding between the goalkeeper and Luiz threatening to break the deadlock. Alex Pritchard was unable to react quick enough to convert that half chance, while Josh Murphy failed to add to his eight goals in all competitions with a wild effort before the half hour. Wastefulness in the final third was not something restricted to the hosts, with Chelsea lacking quality on their deliveries into the Norwich penalty area. Five minutes after the restart, Batshuayi finally recorded a shot on target, but the Belgian striker’s effort from distance lacked power and Angus Gunn had no trouble gathering. Conte’s half-time words clearly had an impact on Willian as he began to run the show, the Brazilian creating one chance for Danny Drinkwater before seeing Gunn get down well to save two low drives. With 16 minutes remaining, Conte replaced the misfiring Batshuayi with Alvaro Morata, but even his first-choice striker was unable to provide a winner. All the visitors could muster was a poor David Luiz free-kick from 20 yards, an effort that sailed harmlessly wide and failed to test Gunn. Charly Musonda and Davide Zappacosta went close late on, but Chelsea failed to deliver the outcome Conte would have wanted as they add a replay to their already busy schedule. Email “Chelsea's second string fail to fire as Premier League champions held by Norwich ”. Feedback on “Chelsea's second string fail to fire as Premier League champions held by Norwich ”.